How To Edit Your Way To Better Poems - Writer's Relief, Inc.
March 21 is World Poetry Day! And we can’t think of a better way to celebrate than with expert editing tips to help get your poetry into submission-ready shape. Okay…sitting on a beach sipping a piña colada while editing your poetry might be an even better way to celebrate—but to each his own. 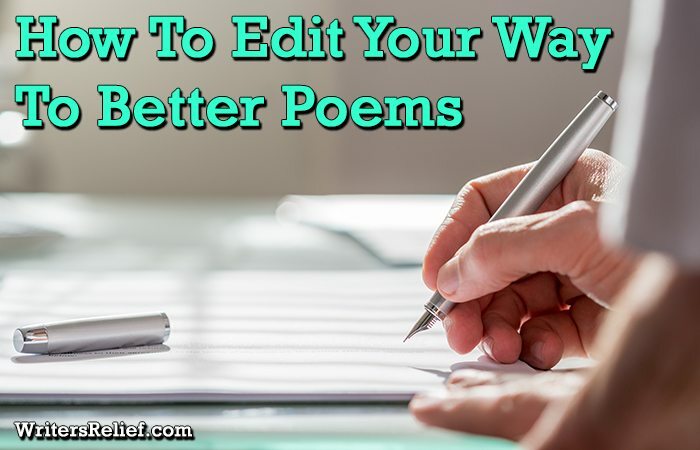 Wherever you’re writing your poetry, if you have a poem that you’ve put aside because it just didn’t seem to gel, or you’re working on a new poem that could use a little something extra—smart editing is the answer! Re-examine your line breaks. Using enjambment—allowing a sentence or clause to carry over into a new line of a poem—not only changes the rhythm and flow of a poem, but also helps to emphasize certain key words or phrases. If you want a particular word in your poem to stand out, try breaking a line right before or after that word, to draw attention to it. Reading poems that feature enjambment will help you understand how effective this literary device can be. Consider switching between form and free verse. You might prefer free verse over form poetry, or vice versa, but practicing writing poems using both styles can be an effective exercise to help see your work in a new light. Try choosing a unique poetry form and rewriting your free verse poem using those conventions, or take one of your sonnets or haiku and rewrite it as a free verse poem. While you may ultimately decide to revert back to the original style of poetry, practicing these different types of writing may help you discover areas in your poems that may benefit from being reworked or tweaked. Rethink your beginning and ending. If you feel like your poem is too long—and keep in mind, shorter poems are easier for editors to say “yes” to—try shortening the beginning or ending. Examine the start or finish of the poem closely; you may notice that the piece begins a little too slowly, or that the poem continues on well past its natural ending. Try removing the first or last few lines and reread your newly revised poem—is the beginning now more engaging, or the ending more powerful? If not, simply restore the lines you removed! Read your poem aloud. It may seem obvious, but the sound of a poem is just as important as the actual content. If you haven’t listened to your poem being read out loud, read it yourself, or have a friend read it to you, so you can better hear how the entire piece flows. Listen for alliteration, repetition, and rhythm, and if you find any areas lacking in these important poetry elements, go back and rework those sections. And later, when you give a poetry reading, you’ll already know your poetry sounds as good as it reads. These tips and exercises can help you make the most of a poem that you’re still wrestling with—or help you find new areas for improvement in a poem that you felt was already completely finished. Before you send your work out into the world, don’t forget to give your poems a final once-over with a critical eye to ensure they have the best possible chances of being published. QUESTION: What is your best tip for improving a poem? ← ProofNEEDing: Be our guest? Those editing tips are great. Thank you.